EVEN when Julian Sargent was still in college, Barangay Ginebra coach Tim Cone already had an eye on the former La Salle cager. Now, Cone finally has the player that he wanted. 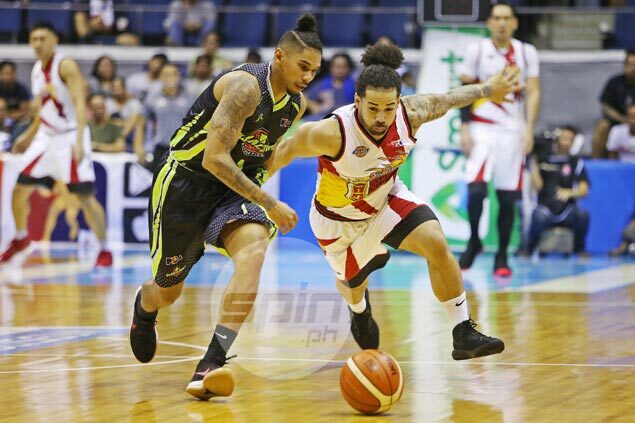 “He was a guy we are looking for in the draft,” Cone, who for a while served as La Salle consultant, said a day after the trade that brought Sargent from GlobalPort to Ginebra in exchange for Paolo Taha. The 16th pick overall in the last PBA draft also had little minutes at GlobalPort, where he averaged 2.29 points, 1.71 rebounds, 0.71 assists, 0.29 steals, and 0.29 blocks through seven games in the Commissioner's Cup. But Cone has big plans for the Fil-Am forward, who he said has the versatility to play multiple positions much like Gabe Norwood and Matt Ganuelas-Rosser. “He is not a veteran like them but we see him kinda like a Gabe Norwood, Matt Ganuelas-Rosser type of mold where he can play guard and different positions,” said Cone. Sargent was not around during Barangay Ginebra’s win over Columbian on Wednesday night but joined the team on Thursday during practice. The Ginebra coach said bringing in Sargent also brings down the Kings' age average. “There is no secret, our core is getting a little old in some regards and we are trying to get some young guys to come in and contribute to our core. Someone we feel that we can develop. He fits the bill,” said Cone. Cone, however, said the 6-foot-1 Sargent will have to find his way to the Ginebra system to reach his full potential. “We will see how Julian goes. I think he has great potential but it’s not going to happen right away. He’s going to have to develop. But I think he has good potential to help in multiple ways and multiple positions,” said Cone.